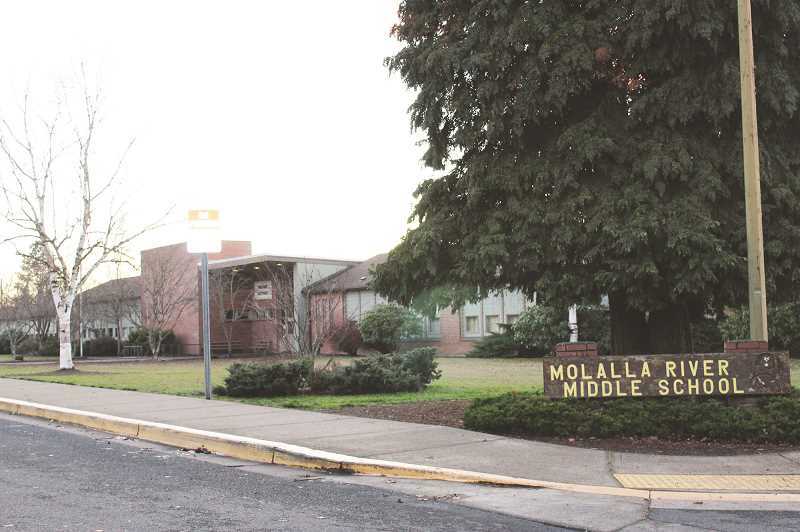 Last year, Molalla River Middle School Head Custodian Karen McElfish spoke up about the amount of waste that was being created on campus, put her foot down and led the school to becoming the only certified green school in Molalla River School District. "I thought, there's got to be a better way to do this," McElfish said. "I'm an old hippie. I just don't think everything needs to be disposable." McElfish invited Language Arts Teacher Sheryl Schiefelbein to come on board, and the two now co-chair the school's green team. They applied last year with Clackamas County and worked through the process to become certified green. This included an audit, which the students helped with. "The kids were involved in weighing all of our trash and our food waste," McElfish said. "And then we decided how it was best that we could recycle and save on trash and food waste and just all the debris." She added, "The kids really enjoyed doing the audit, because they had no idea about how much waste they produced. It made it real for them. It was tangible." Through the audit, they found that the school's food waste was minimal, but they had other problems. "Most of our garbage was Styrofoam plates and milk cartons," McElfish said. With that information, the green team set goals which they had to make progress on in order to achieve the green status. Noticing that they had four gallons of milk waste every day, they decided to use buckets to pour out the milk and then run it through the garbage disposal instead of the trash. With the help of the Parent Teacher Association, they also installed refillable drinking fountain stations to reduce the use of disposable plastic bottles. Finally, they worked towards ridding the lunch room of polystyrene plates. Through a Clackamas County grant, just this week they ordered reusable plastic plates as replacements. The grant allowed for the purchase of the plates, but the funds for additional dishes, like bowls for soups and dips, came from refunds on all the bottles and cans students and staff have been recycling. All the hard work paid off and now MRMS is a certified green school. "We were very proud of the whole thing," McElfish said. "We've got our sticker on the front door and our plaque. The kids…we're hoping that they will take these skills home."